There are few iconic places I feel should be on all traveler's bucket list: Versaille, Great Wall of China, Pyramids, and last but not least Angkor Wat. AW is a temple located in the city of Siem Reap in Cambodia. If you are looking to go there from US, your easiest bet is probably fly directly to Hong Kong, then take a nonstop flight on Dragonair to Siem Reap. Before coming here, there are few things you need to know. First there are two seasons, monsoon season which is basically May till November. Dry season is December to April. Best time to go is January or February because it is the coolest time of the year and are the none raining months on the calendar. I went at the end of October. There were some rain here and there but typically it rains hard for 30 minutes and rest of the time is either sunny or overcast (and humid!). In terms of visa, you do need a visa to go to Cambodia. I got mine in the US; it was an easy process. Last but not least, even though the official currency is Cambodian Riel, in reality it is US Dollar. You don't need to change your money to Riel before you come here as Dollar is pretty much accepted as the defacto currency. Khmer culture is an interesting one. Before coming to Cambodia, I did very little research as my friend who lives part time in Siem Reap had asked her friend, who's a professor at the Royal University of Phnom Penh, to come and lead me to various temples. Since he teaches history of these temples for living, I was thrilled to have him as my guide as he knows these temples better than just about anyone in the World. After few days spending with him, two highlights I learned was: 1. These temples used to be Hindu temples and they are greatly influenced by Indian mythology. 2. Things that I associate with Thai style actually originated from Khmer culture. The funny thing is I told him XYZ looks so Thai. Did Cambodians copy Thai? He replied, actually Kingdom of Cambodia came way before Thailand existed. They copied us. Me: oopsy..... #facepalm. Few temples I love to highlight (despite I saw more than a dozen temples within few days... 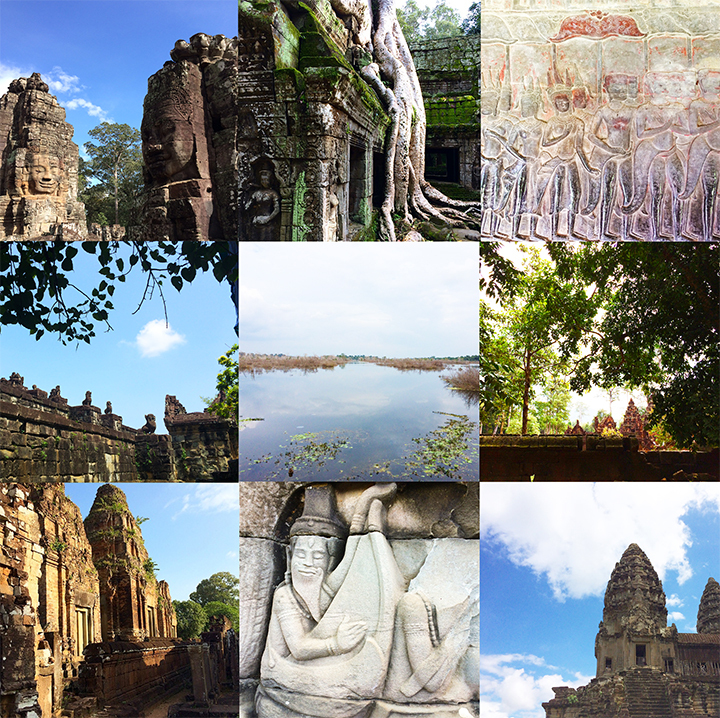 I lost count on how many): Ta Prohm, Angkor Wat, Neak Paon, Bayon, and Banteay Chhmar. Area around Angkor Wat was made even more famous by Hollywood hit film Tomb Raider starting Angelina Jolie that came out in 2001. Most people associate the film with Angkor Wat. But in reality, the film was shot at Ta Prohm temple which isn't too far from Angkor Wat. This temple is best known for overgrown trees straddling temple walls and roof. It's an absolute must for anyone visiting Siem Reap. It is purposely not rebuilt so that it can have a neglected look which I much prefer when compare to Angkor Wat. Because of the movie, there will be whores of people so go early. Angkor Wat temple is a huge Khmer Palace built in 12th century. The ground is big.... over 400 acres! It was originally Hindu then turn Buddhist. So you can see Hindu carving on walls and Buddha stand alone statues on the top floor. On the bottom floor you will see bas-relief friezes along an open gallery. The amazing carvings just go on and on and on. You can spend all day just following the story on these carvings. This temple had been cleaned up more so than any other temple around. While it definitely doesn't look spanking new, I prefer the ones that look less pristine. I was told usually there are tons of people standing in front of these friezes but on the day I was there, I could roll a bowling ball down the gallery blind folded and it would not hit anyone! I was happy to finally see Angkor Wat, but it was not my favorite temple. Neak Paon (Holy Island) is a temple in the middle of a lake. I was told when the temple was first created, it was in a lake. However, the lake had slowly dried up centuries ago and people started to farm there. The government of Cambodia decided fairly recently to flood the existing farmland and return the temple to its original state. The only way to access the island would be to walk along wooden plank path from shore to the island. Flooding of the farmland was controversial but I get why they did it.... the lake is just beautiful. The temple itself is actually in the middle of another lake which you can't really get to but the sight of the exterior lake and the romance of walking on this long wooden path to reach this holy island made this excursion worth it. Neak Paon is not the most popular temple in Siem Reap but I highly recommend it. Bayon is one of those iconic temple that when I first saw it for the first time, I had a revelation... I saw that face on a wood carving at my local spa before!! Now I know where that face came from. Chances are you also saw that smiling Buddha face relief panel at your local spas as well. Besides hundreds of smiling Buddha's all over the walls, there are also carvings of a naval battle among other mythology. This temple is centrally located in the temple area and you will definitely pass it when you go see Angkor Wat. I would say 100% worth your time to walk through this temple. Last temple I like to highlight is actually not in Siem Reap. It's actually about 2.5 hours of bump road ride outside of Siem Reap close to Thai border. It's one of those temple that is so rundown that if you want to truly experience what it feels like when Angkor Wat was first discovered by an outsider, this temple definitely fit the bill. Because it is so far from Siem Reap and the road to Banteay Chhmar isn't exactly all paved asphalt, few tourist ever made it to there. In fact, the asphalt was laid just few years ago so it used to take even longer. The fruits of the long ride is you pretty much get to tour the whole temple all by yourself. It literally look like Tomb Raider/ Indiana Jones movie set... overgrown trees intertwined with falling apart temples. You have to climb over rocks, well, more like what used to be temple pillars/ ceilings, to reach the inner sanctum. This temple is best known for the thousand arm Buddha bas-relief. I believe it's the only kind in existence in a Cambodian temple. I was told the whole temple has two or three of this particular relief. Because the temple is so close to Thai border, my understanding is smugglers would pop over from Thailand from time to time and chop up the temple to sell on the black market in Thailand/ Western world. So if you get a chance, definitely go see it before all the reliefs get stolen. On this trip, I didn't go to Phnom Penh so I can't say anything about it. But I did left Siem Reap with great memories of the history and the people of this wonderful country. I look forward to return to Cambodia someday.